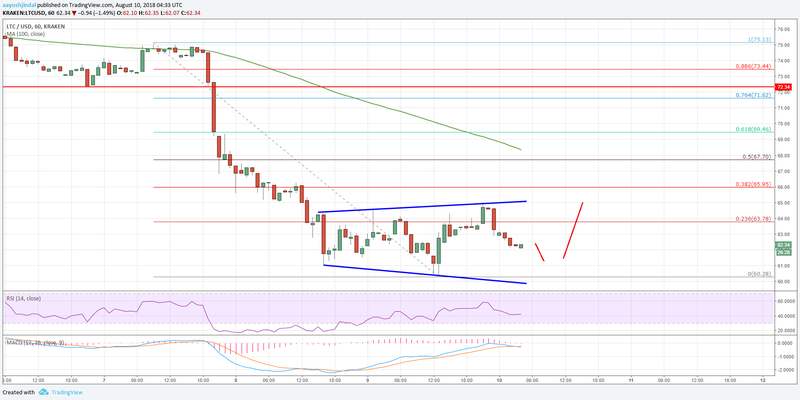 Litecoin price is holding a key support near the $60.00 level against the US Dollar. LTC/USD may perhaps slowly recover as long as it is above $60.00. Litecoin price attempted a minor recovery above the $64.00 level, but failed (Data feed of Kraken) against the US Dollar. There is a key expanding triangle forming with resistance near the $65.00 level on the hourly chart of the LTC/USD pair. The pair could attempt a recovery as long as bulls keep the $60.00 support level intact. This week, we saw nasty declines from well above $70.00 in litecoin price against the US dollar. The LTC/USD traded lower and tested an important support near the $60.00 level. Looking at the chart, LTC price formed a low near $61.06 yesterday and later recovered. However, upsides were capped and later a new low was formed at $60.28. Finally, there was a decent recovery above the $64.00 level. The price also moved above the 23.6% Fib retracement level of the last decline from the $75.13 high to $60.28 low. However, the upside move was capped by the $65.00 resistance. At the moment, it seems like there is a key expanding triangle forming with resistance near the $65.00 level on the hourly chart of the LTC/USD pair. The pair is currently moving lower and it could revisit the $62.00 support. Below this, the last swing low at $60.28 is a key support followed by the $60.00 level. Below this last, the next key support is near the $56.00 level. On the upside, if the pair manages to break the $65.00 level, it could test the 50% Fib retracement level of the last decline from the $75.13 high to $60.28 low at $67.70. Above this, the price may well move towards the $68.00 and $69.00 levels. Overall, litecoin price is holding the $60.00 support area and as long as bulls are active above $60.00, there could be a decent recovery in the near term.